Patrick Norén in Asia Travel on 5 November, 2017. At 11:22 on 10th May 2017, the K3 train glided silently and without fanfare out of Beijing, China, bound for the Russian capital city on the infamous Trans-Siberian Railway. 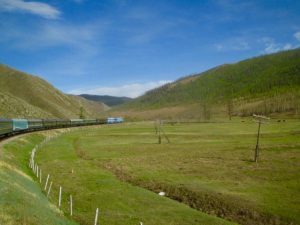 Moscow would be the terminus of my Trans-Siberian adventure, but my first stop would be Ulaanbaatar. I’m pretty sure you don’t want to hear me droning on about the beauty of the mountains of northern China basking in golden afternoon sun, and then sunrise over the awesome expanse of nothing that is the Gobi Desert. I continue my tale from Mongolia’s capital: Ulaanbaatar. The face of the city looks tired, rugged and brow-beaten, though not at all surprising given that it has the dubious title of being the coldest capital city on Planet Earth. While rolling into the train station, I first noticed Ulaanbaatar’s outskirts and their innocent, colourful image. From a distance all the orange and blue roofs, spread up the side of a dull green mountain, made me think of Arctic exploration stations set up solely to house the brave few who venture to those parts in the harshest months of the year. Up close though, the poverty quickly becomes apparent. And this is only in the relatively wealthy capital. One can imagine that in Mongolia’s rural, dusty, windswept, tumbleweed ghost towns, some of which you briefly stop at on the railway, life takes on an even simpler, even harsher, even more depressing guise. Alcoholism is a big problem here. Back in Ulaanbaatar, the grey, sullen, flaking concrete apartment blocks remind you that democracy only arrived in this unique nation in the 90s; Mongolia was a satellite state subservient to Moscow during the Soviet era, and its uninspiring Stalinist architecture is symptomatic of this. The fact that its buildings have to withstand winter temperatures as low as -30oC, and summer temperatures of +30oC degrees only adds to Ulaanbaatar’s depressing, heartless exterior. Ulaanbaatar has some of the worst traffic jams I have ever seen. This is due to a city design where four-lane wide roads filter down into two lanes, followed by a roundabout controlled by a policeman with a whistle standing on a glorified soapbox. Brand new glass skyscrapers, hotels and offices are cropping up everywhere add an interesting and much needed extra dimension to the city. People, money, and indeed ever more cars are flocking here as Mongolia cashes in on a booming economy founded on highly lucrative mining and tourist industries. Ulaanbaatar is slowly but surely moving away from its Soviet legacy. It is creating an image for itself as being a future economic hub in Asia, located in the romantically isolated middle of nowhere. At 15:22 on 18th May 2017, the K3 train, having originated in Beijing one day before, glided silently and without fanfare out of Ulaanbaatar, Mongolia, bound for the de facto capital of eastern Siberia, Irkutsk. On this slightly shorter second leg, only some 24 hours, the landscape turned from open and dusty steppe with no real vegetation worthy of a mention, to trees. Lots and lots of trees. And little wooden “dachas”, or cottages in amongst the trees. The majority of tourists taking the Trans-Siberian Railway take a break in Irkutsk, a small city with a distinctly Scandinavian vibe where the streets are quiet, the houses ornate and wooden, and the people softly spoken. Perhaps the only thing very un-Scandinavian about Irkutsk is that the whole road and pavement shakes when a tram, older than that Orthodox church across the street, rolls by. That is not to say it is devoid of atmosphere, or appeal, however. One afternoon I visited a Fine Art Gallery and walked in on a cellist and pianist rehearsing for a concert later that day; I bumped into a group of all-singing, all-dancing Hare Krishnas while walking down the Angara River; and I also stumbled across a kids’ performing arts show, complete with more singing and dancing, but this time of a more traditional Russian bent. But this hushed, laid-back European atmosphere, despite still being nearly four days train journey away from Moscow, is not why people stop here. One hour down the road, through yet more forest and past more very Scandinavian houses, lies Listvyanka on the shores of Lake Baikal. 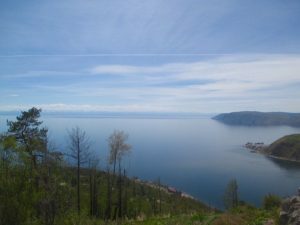 At its widest, 80km, and its longest, over 600km, Lake Baikal is the seventh largest lake in the world by area, but the largest freshwater lake by volume. It’s roughly the same size as Belgium. 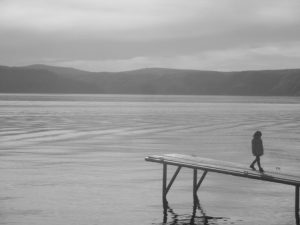 And being in the middle of Siberia, it is also frozen for six months of the year, from December through to May, which makes swimming in it at any time of year the preserve of the brave or stupid. This being the case, I took a very quick dip, and ran straight into the sauna afterwards. At 17:18 on 23rd May 2017, the 069 train, having originated in Chita some 18 hours before, glided silently and without fanfare out of Irkutsk, bound for the capital city of Russia: Moscow. This journey of over 5000km took 3 days, 15 hours and, by my calculations, 53 minutes, for I arrived in Moscow, bang on schedule, at 04:11 on 27th May 2017. Russian trains are super-punctual. And what was the landscape like for these three days? Trees. 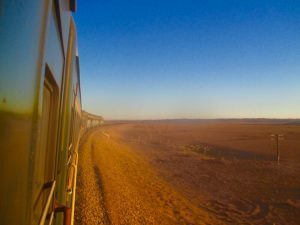 These three days were less about looking out the window, as was the case heading to Ulaanbaatar and Irkutsk, but more about looking around the train to see what I could do. I read the final 100-odd pages of Robinson Crusoe. Listened to a lot of music, including Tchaikovsky’s 4th, 5th (this I listened to three times), and 6th symphonies; Borodin’s 2nd symphony, Prokofiev’s 5th symphony, Shostakovich’s 5th symphony (though I found this somewhat whimsical compared to the above); Mayakovsky’s symphony no.24, and various other Russian works for a Symphony Orchestra – as well as Ed Sheeran’s new album. I also befriended Vitaly, a Russian working for the Communist Party, and spoke English with him to help him improve. In return he helped me start learning his language. I also had some borsch (beetroot soup) and beer with him the night before arriving in Moscow. And I looked out the window onto the endless forests and fields. With that, the journey flew by. 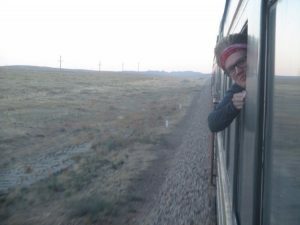 Over the course of 17 days after leaving Beijing, I lived in a yurt in Mongolia, dipped in Lake Baikal in Russia, and ate borsch with a communist on a train. And as we glided silently and without fanfare into Moscow, my journey of 7300km on the Trans-Siberian Railway came to an end.